Elm Point Animal Hospital offers the latest technology in health care for your pet. Low-level laser therapy or cold laser therapy uses light energy to stimulate tissue repair and provide pain management. The laser uses a focused light to stimulate tissue at and below the surface of your pet’s skin. Laser therapy affects tissues at the cellular level, increasing the metabolism of cells, which leads to improved circulation, decreased inflammation and release of the body’s natural pain relievers, such as endorphins. Therapeutic lasers can be used to treat a variety of conditions and ailments for your pet. Most commonly it is used for postoperative pain management after orthopedic surgeries, musculoskeletal injuries, soft tissue injuries (such as sprains and strains), back pain and arthritis. However, it can also be used for other inflammatory issues such as cystitis (bladder inflammation). Laser therapy sessions last from a few minutes in length (if focusing on one specific area) to up to thirty minutes in length. The treatment is safe and non-painful and pets often relax and enjoy their treatments. 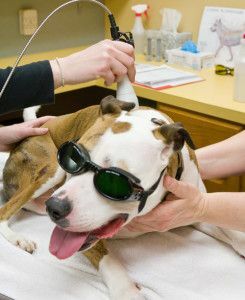 Laser therapy is often recommended in conjunction with other modalities (such as massage or therapeutic exercise) to provide the best outcome and fastest recovery time for your pet. When choosing a treatment option for your pet there is now an alternative to pharmaceuticals. Laser Therapy can provide immediate results without any dangerous side effects. Call Elm Point Animal Hospital today to schedule your pet’s laser therapy sessions 636-757-7350.